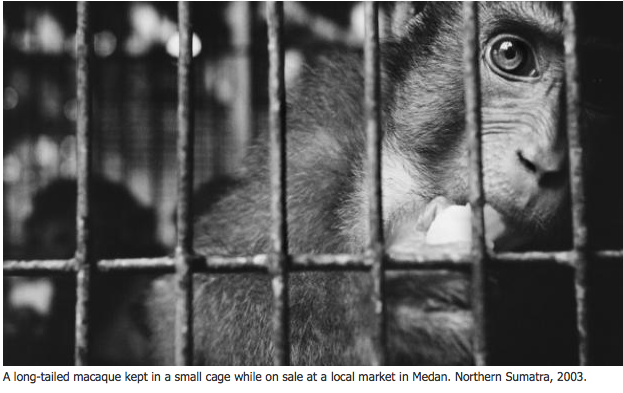 Along-tailed macaque kept in a small cage while on sale at a local market in Medan. Northern Sumatra, 2003. Tomorrow the UK government hosts the London Conference on the Illegal Wildlife Trade, hoping to secure political commitment from governments around the globe to fight the issue. Kathleen Dunn and guests investigate this multi-billion-dollar illegal industry and what’s being done to stop it. © Copyright 2014 by WPR.org and Wisconsin Public Radio. All rights reserved. This material may not be published, broadcast, rewritten or redistributed.